Quote : "Show me a gracious loser and I'll show you someone who gets beat a lot." Don't be fooled; behind those sparkling eyes and warm smile, there lies the heart of a ruthless competitor, who will stop at nothing in her quest to be the best. Despite her youth, Princess Fernypoo has quickly become an accomplished Cheat! 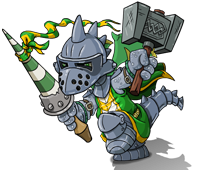 player, and is always a leading contender to come away with a victory at most of Neopia's top Cheat! Tournaments. However, as word of young Fernypoo's volcanic temper spreads, tournament organisers have become increasingly wary of sending her an invitation. As a young Cheat! player in her father's castle, the Princess gained a great deal of confidence by defeating all the royal subjects. It wasn't until later that she learned her father had instructed his servants to lose, stating strictly that anyone who beat the Princess would find themselves at the bottom of the royal moat. Much to the king's surprise, one day his daughter announced at dinner that she would soon be leaving the Royal Estate, in hopes of seeking her fortune as a professional Cheat! player. No longer under the protection of her father, the Princess struggled in her first few tournaments. Unaccustomed to losing, Fernypoo took great exception to being thrashed by her opponents, and soon her infamous temper began to show. However, her great arrogance kept her from giving up and returning to her parents' castle as a failure. Refusing to quit and go home, Fernypoo's natural ability was soon bolstered by the the experience which she was now gaining on the tour. Within months, the Princess had become a top player. Though she has yet to defeat Spectre, the circuit's current champ, Fernypoo's loyal fans believe that one day the Princess will claim her throne as Neopia's top Cheat! player... that is, unless her wicked temper gets in the way.